Posted by todd under: Crashes; My bikes . I found the Fuji S-10-S at a yard sale. The owner wanted $20. I already had a couple of bikes, and it was just a bit small for me, so I left it there. But I couldn’t stop thinking about it. Later that Saturday, I returned to the sale. I think I got the bike for $12. It still had the original Primus frame pump. “I guess it was just waiting for someone who would appreciate it,” the former owner told me as I wheeled the Fuji to the minivan. I did appreciate it. 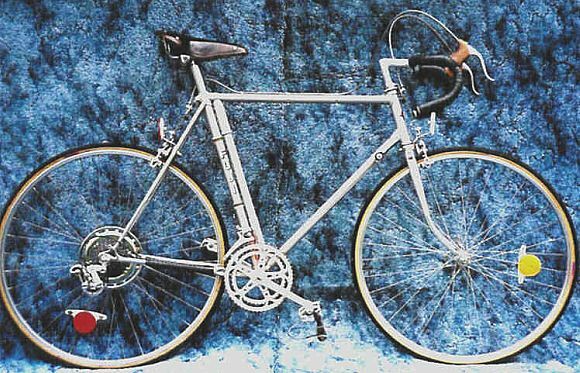 Later I would find out that this was a historically significant bike — one of the first mass-marketed by the Japanese in the United States during the bike boom of the 1970s. It had a six-speed freewheel. I e-mailed Internet bike guru Sheldon Brown to ask his opinion about whether it was worth fixing up. He thought it was. After finding three shiny cable guides at a shop in Lincoln, Nebraska, during a fun outing with my dad, the S-10-S finally looked and rode like I wanted it to. And it was a sweet ride. The frame, light and flexible, seemed to work with me as I pedaled. One Saturday not long after the Fuji was finally dialed in, I took off for work on it. It was a partly cloudy, cool day, a great day for a ride. Then again, they all are. Since traffic is normally pretty light in my neighborhood in the middle of a Saturday afternoon, I didn’t bother to stop at the stop sign less than two blocks from my house. I picked up speed around a corner and started rolling through the sign to make a left turn. I looked left and looked right. I looked left again … just in time to see a red sports car that might as well have risen straight up out of the pavement. My front tire hit the fender. The driver had braked when she saw me, but I had no chance. Over the bars, and over the car’s hood, I went. I rolled, landing on my left shoulder and smacking my helmet in the middle of the street. Because traffic was light, I had time to get up and stumble out of the way. Then, ugh, I examined the bike. The front wheel bent like a taco shell. 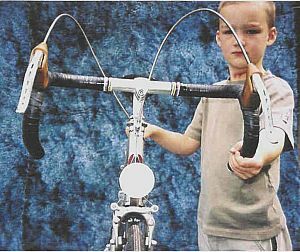 The front fork ends pointed in divergent directions. (As you can see at right, they used to be so pretty!) The killer was, I could see the paint flaking off the top tube and downtube right behind the head tube. The frame was done for. I carried the bike home in dismay. The frame hung in the garage for more than a year before I could bear to part with it. I was sorry to see that Fuji go, but I would have been more sorry if I had not been wearing a helmet. The helmet cracked when it hit the pavement. That would have been my head. I dinged my shoulder a little. That was it. It could have been so much worse, in so many ways. I’m glad it was the bike, and not me. 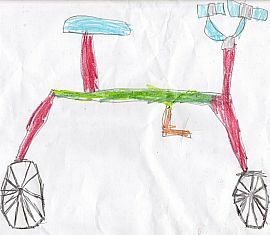 But I did love that bike. Many of its parts now live on my Bridgestone XO-1. I rolled through the stop sign when I should have stopped, or at least slowed down. I was not careful. It was just that simple. I am now. And while I checked the street to either side of me, I did not check the driveway across the street. That’s where the car came from. I just completely missed it. Sometimes looking both ways is not enough. I needed to look three ways, and then look again. Now, I try to do that. What did I do right? I wore a helmet. This wreck could have resulted in a serious head injury. Also, I took responsibility for the crash. It was my fault, and I deserved to pay. I am glad I didn’t have to. It might seem strange to write about crashes on a site promoting bicycle commuting, but let’s face it, crashes can happen. We riders can do a lot to prevent them. We don’t always do all we can. Here’s how I see it: I have learned a couple of things the hard way. If I tell you about it, maybe you won’t have to. Read about my other crash. 6 June 2008 at 8:04 am. I have a 1976 S-10-S that I built when I worked a bike shop back in 1976. It has less than 100 mile on it. I have it posted on craigslist for $300. What do you think it is worth? 24 December 2010 at 12:08 am. Hi Todd. Sorry to hear about the S-10S. 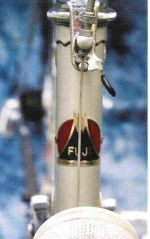 I’m a fan of the Fuji brand and it’s always sad to hear of one ending this way. Question, are you using the Primus frame pump? I’m restoring a 72 Fuji Newest and that pump was original equipment. If you’re not using it, might consider selling it, and would like help a guy out let me know. As an aside, although I hail from Minnesota now I spent 24 years in KY….both Versailles and Danville. 19 January 2012 at 9:31 am. 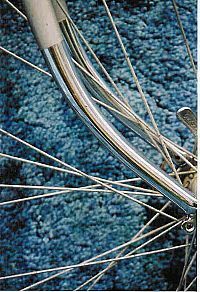 After I crashed my Schwinn Continental in about 1975 (similar chipped paint from bent top and down tubes as your bike and the fork was “reshaped” as well) I got a brand new White S10S with a 25″ frame. I earned the money working as a bike mechanic at the shop I bought it at. Bit by bit I customized it with Crome-Moly fork, sew-up tires and wheels and finally a real road racing frame (’82 Team Fuji). It’s probably no help to you, but I still have the original front fork, brakes, crankset, derailleurs and front wheel from the S10S. Can’t remember what I did with the rest of the frame! 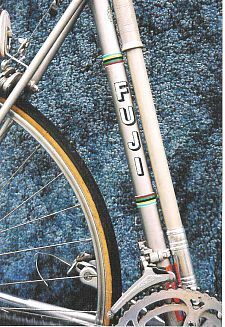 Sadly, my Team Fuji bike was stolen in ’87 or ’88. 28 May 2013 at 5:13 pm. I have that pump. In perfect con. 4 September 2014 at 9:20 am. I have a primo condition Fuji S10-S…..I am looking for a new or used rear gear set with the smallest gear possible for the highest gear…it’s a 6 gear cluster….anybody have one for sale or know where to look?